Foto: Jan Kåre Wilhelmsen, Universitetet i Bergen. Sundaran Kada holder fredag foredrag på den internasjonale ISRRT-kongressen i Toronto, Canada. Temaet er norske radiografstudenters kunnskap om stråledoser, som viser seg å være for lav. Det er 17. gang The International Society of Radiographers and Radiological Technologists (ISRRT) arranger kongress, som denne gang varer fra 7.-10. juni. Fra Norsk Radiografforbund er forbundsleder Anna Pettersen og fagsjef Håkon Hjemly representert. 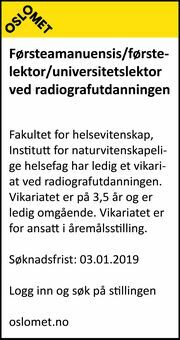 Kada er i år eneste norske foredragsholder, med "Awareness of X-ray Radiation Doses Among Norwegian Student Radiographers". I Hold Pusten nr. 4 - 2012 kunne du lese hans egen fagartikkel om temaet. Den bygger på en undersøkelse Kada har gjennomført blant sisteårs radiografistudenter i Norge. Konklusjonen er dessverre at kunnskapen om stråledoser og strålerisiko er for lav. Sundaran Kada er utdannet radiograf, og tok doktorgrad i 2011. Han jobber som høgskolelektor ved Høgskolen i Bergen. To assess the level of student radiographers’ knowledge concerning both the radiation doses received by patients undergoing commonly requested radiological investigations and the associated risks of these doses. All Radiography institutions (n=6) in Norway were surveyed using the self-developed questionnaire related to radiation issues. The study population (n=122) was final year student radiographers in their final term of study. The response rate was 79% (122/155). The majority of the student radiographers reported poor knowledge of radiation doses. They were either ignorant of or underestimated the radiation doses used in the various imaging examinations. Only 6 student radiographers answered 50 % of the items in a questionnaire designed for assessment of their level of knowledge correctly. Overall 63% (n=77) of the student radiographers were not aware of the radiation dose received from a chest x-ray, and 64% (n=78) of the students were ignorant of the annual dose limit for the patients. The study identified no statistically significant differences in mean score among radiography institutions (p=0.08) and between genders (p=0.61). Overall, final year student radiographers’ knowledge regarding radiation doses and the risks associated with ionising radiation is reported to be poor.